It’s been a long, long time since I messed around with Google’s push notification messaging. In fact, the last time I played around with it, it was still called “C2DM,” or Cloud to Device Messaging. 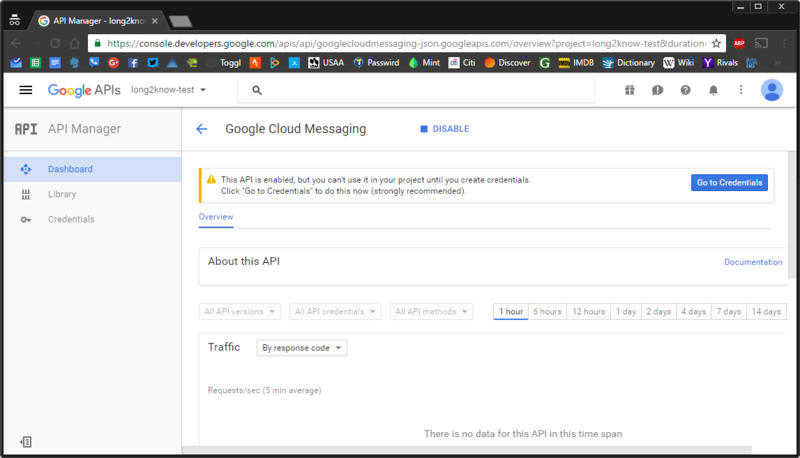 Since that time, “GCM,” or Google Cloud Messaging was introduced. 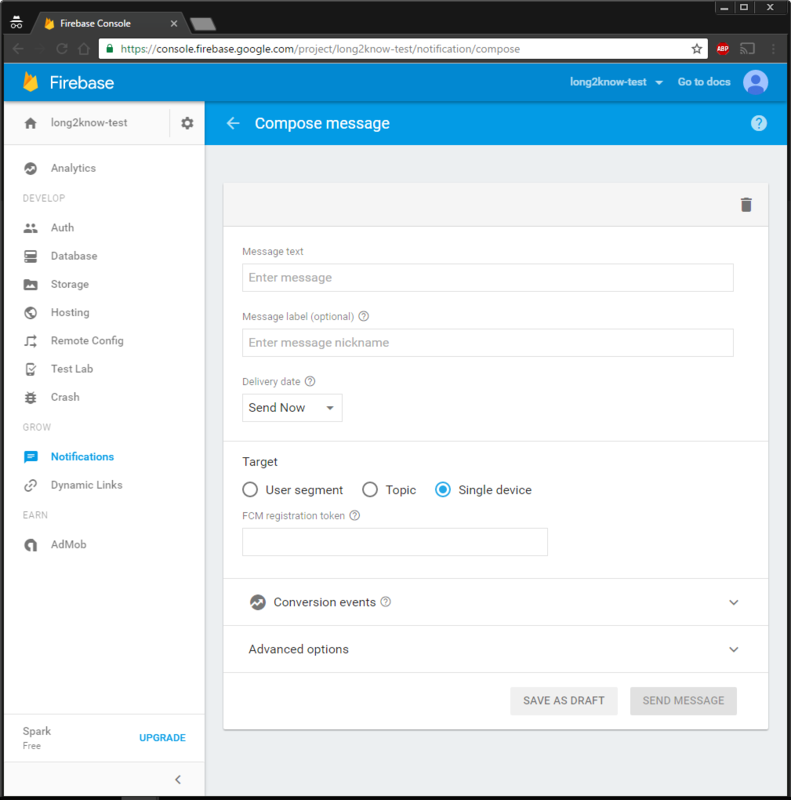 And even that is superseded by Google’s new Firebase (FCM) messaging. The most recent iteration is very interesting since it’s cross-platform and directly supports iOS, Android, and Web notifications. My side-project for the weekend was to get reaquainted with push notifications / messaging and do something useful with it. 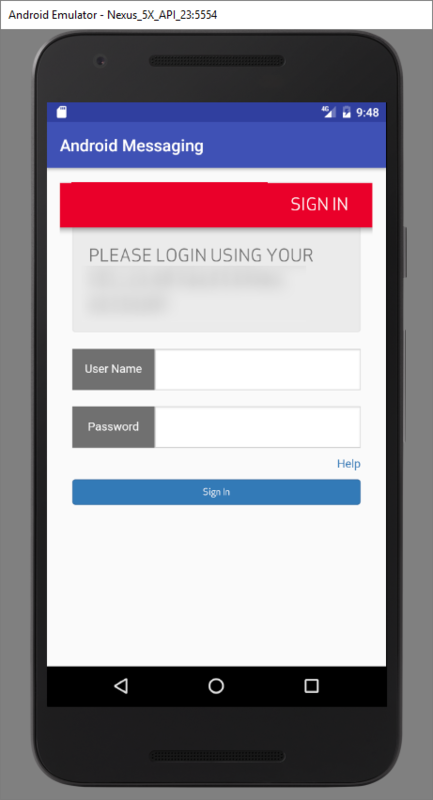 The initial concept I had in my mind was to create a mobile application to allow users to opt into (company) notifications, utilize my SSO server for identification of the user, and then actually transmit notifications to the user. 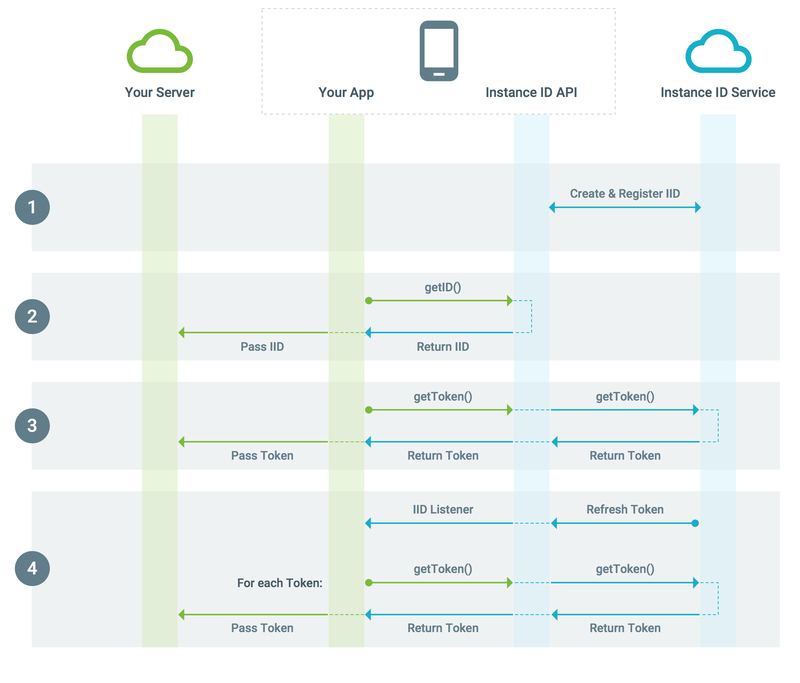 Once I started looking at how Firebase works, these appeared to be attainable goals. On a side note, why would I want to do these things? Well, it gets rid of things like email distribution groups, AD management, and other, imho, archaic methods of notifying/messaging individuals. 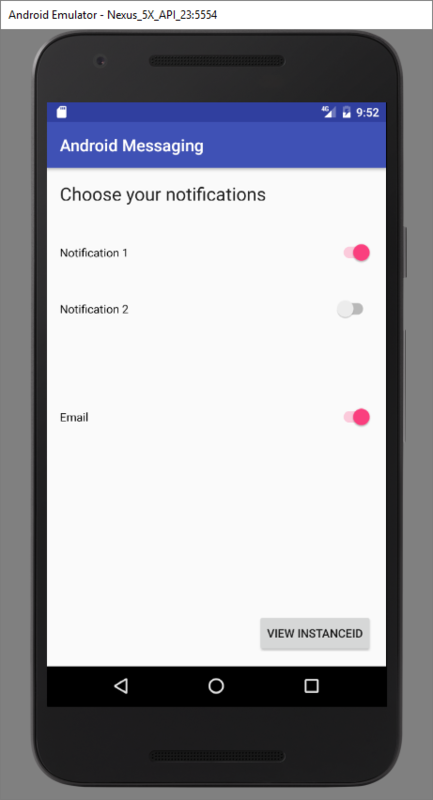 Since the identity of the user is known, we can present them with notifications that are both personal AND since we know their claims-based roles, we can let them receive topic-driven notifications. 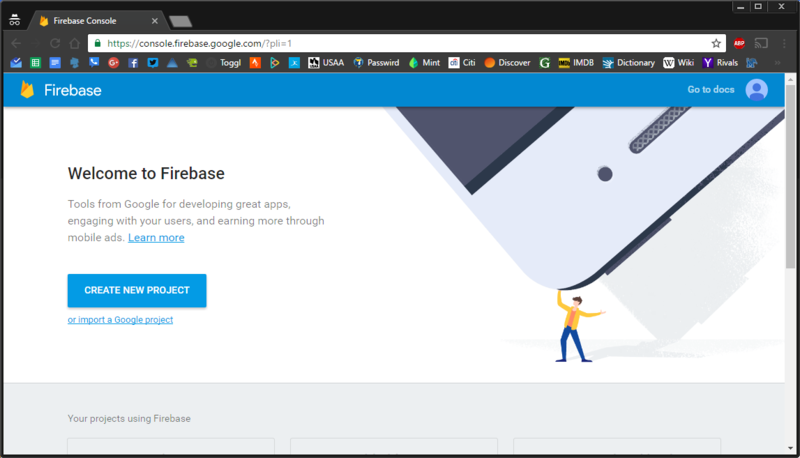 As I said, Firebase is cross-platform. 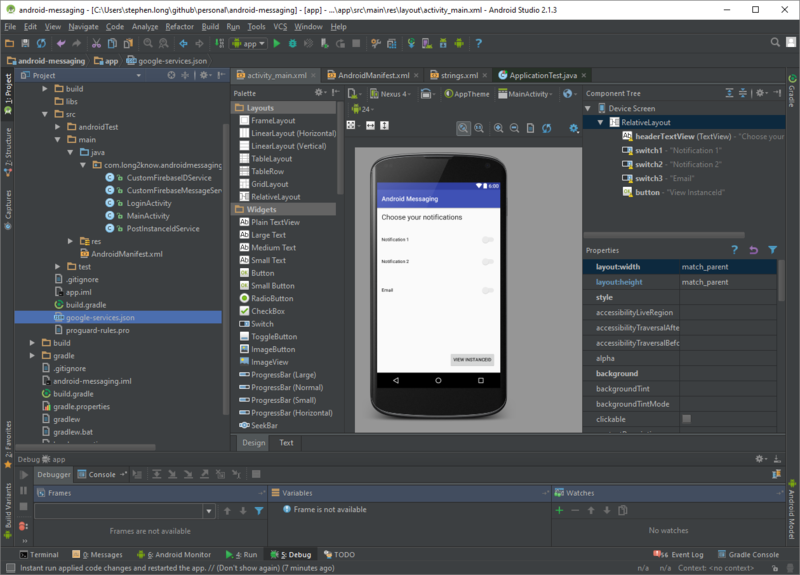 My first pass at utilizing it, though, is via Android Studio and the Android emulator. 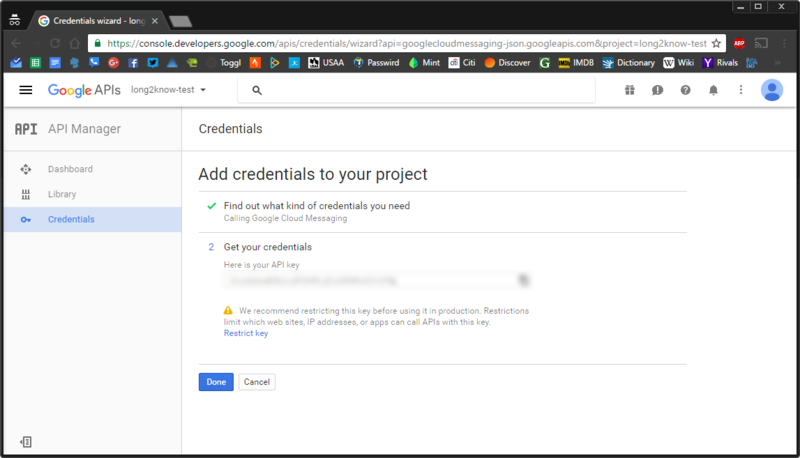 Diving right in, I utilize a test Google account for development work. 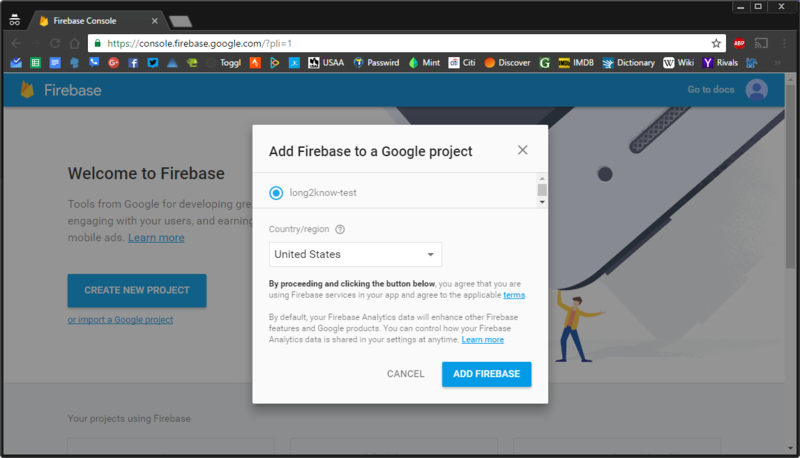 In order to use Firebase, a project has to be created under whatever account will be used. Google’s set-up process is pretty painless. Here are the steps I went through initially. That’s it for the remote setup. You will also, for an Android app, need to go to the project settings and download “google-services.json.” This will contain all of the API key information that you can bring into your Android Studio project. So, I jumped right into Android studio and created a few activities, services, and various classes. You can see that I dragged/dropped the “google-services.json” file right into my project. In my case, since I am tying into my own security backend, I am following the flow of logging in the through OAuth to my SSO Site via a WebView, and then as the user gets a new InstanceID (since the InstanceID can change based on various factors), I am recording that ID on a per user basis. This provides a means to provide individually tailored notifications beyond the topic/group subscriptions. Imagine, let’s say, that I want to send a specific user a notification because they received a bonus, have a paycheck available, or something else of that nature. For the Android piece, I won’t bore you with my “LoginActivity,” that provides OAuth login via a Webview, since it’s pretty rudimentary, but the pieces to get the FCM messaging working are interesting and actually pretty small. 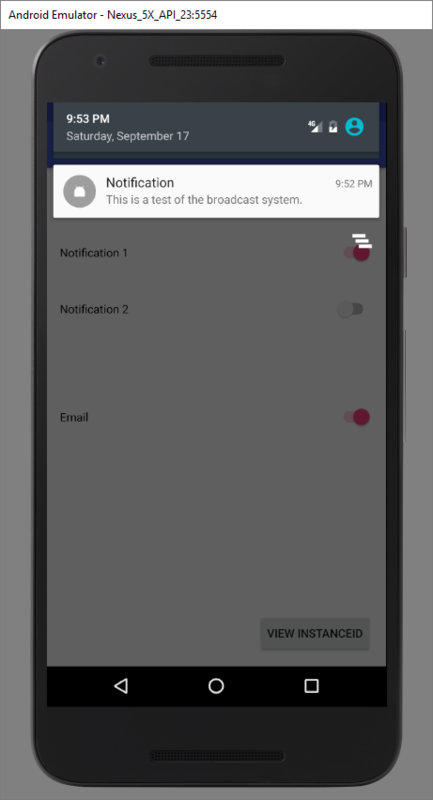 In the application manifiest, we have to tell Android to listen for the intents provided by the Firebase Message service and InstanceID service. Typically, you will have your own implementation/inherited classes that listen for these intents. You can see I prefixed mine with the “Custom” moniker. The implementation to listen for, and log, InstanceID changes is below. I have my own service called “PostInstanceIdService” which attach the OAuth Bearer token to a POST request and send the InstanceID to my own server. That’s really all there is to it since the Firebase classes already do all of the heavy lifting. The other intents we want to handle are those that deal with receiving notifications. This is also a fairly rudimentary bit of code. Eventually, I’ll have this running as a background service to be more useful. With the project building and running in the Android emulator, I can use the Firebase console to send messages. And there you have it. With a relatively minimal amount of work .. well, the security piece actually took me a while to get right .. it’s pretty easy to create a managed topic/message distribution system.